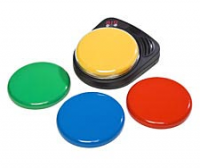 Use it as a single message communicator for beginners and progress to a two, four, or eight message communicator as the user's needs and abilities change. No need to learn a new device instead, simply change the keyguard / symbol holder. SuperTalker features 16 minutes of recording time and a total of 8 levels of messaging capability so you can store as many as 64 messages!